Would like them to be above 1.5 GP but with the right roster (like CLS (also if you’re about to get him) and progress towards JTR) I would be more than happy. We’re all focused on working towards the HSith, helping each other out, and having a good time doing it. Fear is the path is an active 27 mil.gp guild looking for new members. We are currently 28/50 members. running heroic pit and working towards heroic aat. We have great team members that are willing to help if needed. Discord req. and 24 hr o dam on Pit. So if you are looking to grow with a good group can be a daily player, contribute and can follow a few guidelines this could be the place for you. All are welcome. If you are a smaller guild and would like to merge with us we can do that also. Potentium Padawans is a guild for casual players or veterans just burned out from the daily grind. Only rule currently is to stay active. Members absent for more than 2 weeks are eligible to be replaced. We are part of a small alliance (The Potentium Order) of veteran players and we created this guild to give our veterans who need a break from daily 600 a place where they can still contribute and help out newer players. A great place to grow and learn from folks who have been there before. Just now opened, plenty of room. We have a great community on discord, but it is not required for this guild. If interested, just get in touch here or on discord. Heroic Raids HAAT, pit. 24 hours 0 damage rule. TW 20+ wins so far. Looking for level 85/1 million GP preferred. Can make exceptions. Most of us have been together since guilds launched and we are looking to integrate a few more chill and no drama people. We are building towards heroic sith. PM me if interested. We are looking for new active members who want to grow together through all the content the game has to offer! Our rules are simple and straight forward. Our crew has a no drama policy and has little tolerance for repeat rule offenders. We like those who want to learn, grow and game together! No abusive or toxic players. Harassment with other players will not be tolerated. Players who are away for an extend periods are expected to post an ETA of their return date. Otherwise they run the risk of being removed after one to two weeks. Heroic raids have special rules. They are posted in game and in discord to remind. If unsure what to do then join the raid to get the rewards. Looking for players with a GP of 500K or higher. Active players contributing daily to raid tickets. We have an open channel in discord for new people to join. All are welcome to meet the guild, ask questions and learn what we are all about. You are also free to contact me here in the forums or add me as an ally. The Old Folk Home wants you to retire with us!!! 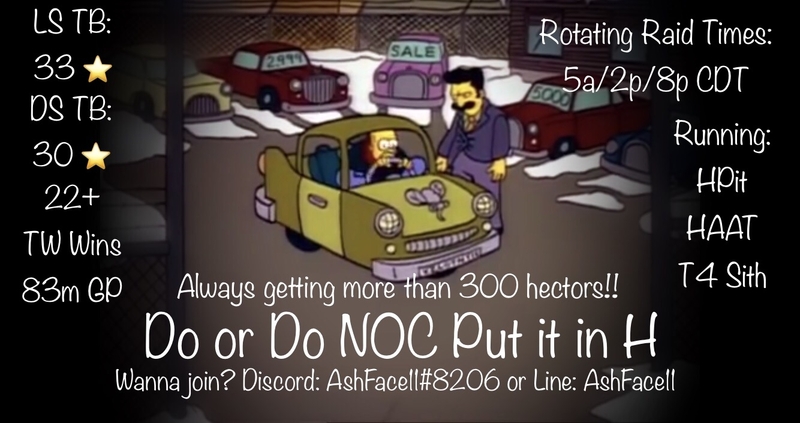 We have a few spots open ... We are a Mature bunch (hence the name) who have recently formed a break away guild from what could be considered a mega guild. We have heaps of experience, with a very good understanding of how to win. You gotta be 18+ because we speak our mind. We are respectful though, and you gotta be too. Currently we are 45 peeps with a GP of 100mill so we need you so we can start getting the better TB and TW rewards! We walked over our last opposition again. 600 tickets a must and you need to have been playing for at least a year. Our Raids are run as follows: Australian time zone: HPit damage phase will open at 6:30pm (guild reset) HAAT damage phase open 7:00pm (30min after reset) and Sith Raid is started as soon as we finish the last. We are about to step up to Heroic and need a few more 2 million + players to make that transition less painful. Currently a tier behind. Were using discord and have bots setup to help with game coordination, so DM me if you want in Chur! Trilium just got one spot free, due to a member who quit the game. You want General Kenobi shards? -> your right with us (we dont have any specific HAAT squad requirements for you, since we easily beat this raid). Atm we focusing on getting ready to beat in the near future the hstv (30 jtr teams + almost all other teams ready). GP: 106 Mio, last Ls TB we reached 37*, last ds tb 38, tw = 20 wins, 1 tie and 4 loss. We are not any of those big guild alliance consisting of 10thousend of sub guilds, we are rather a small family who enjoys playing and having fun together. Helping each other, giving advice and sticking to our simple rules (fe 24 hour cooldown, joining discord chat app and following tb and tw instructions) is a given thing. We are a laid back guild, which has no crazy requirements, but we are anyway at the same time ambitious and well organized. If you see yourself in all this - than its you, who we are searching for! Heroic Sith Raids are tough, but Steevo's Falcons is a guild that has the heart and determination to accomplish it! We are an American based guild that's reaps rancors, topples tanks, and now we slay the sith. We currently heroic rancor and tank, and t6 the sith. Heroic is around the corner, so if you can't get in to a heroic guild and are pretty close on having the toons, you are in! We are a stand alone guild that does not have any alliances to worry about. Our reset is at 7pm central time. If you are interested, message me on LINE at deedeejo21 or you can message me on discord at DarthDeeDee#6053. We are a very active guild that just formed new out of an 133GM Guild. Many of us are Veteran Players willing to help and push "smaller" Players. 0 damage in the Heroic Rancor raid until the start time (rotating). We remove members who have been inactive for a couple of weeks. Apart from the above, we let you play how you like. We don't force you to spend crystals to earn 600 tickets per day (but getting close is appreciated). We used to have 50 members, to have better chances and rewards in TW and TB. Asteroid M is a guild we started two weeks ago, and we’re trying to fill our ranks. We’re looking for strong players to help us crush raids and territory battles. Please contact me here, in the game, or on Line. 4 day T5 sith raid. Heroic AAT and Pit Raids. 15 open spaces=bring your buddies with you. Help bring a guild to victory rather than tagging along for the ride. LP Padawans League is a mid level guild with 35 mil GP that currently looking to fill 10 open spots. We are very active and do Heroic Rancor on a regular schedule. Automatic start at 7pm ET with 24 hour join period. We also do NAAT on automatic schedule at 8pm ET with 24 hour join period. Gearing to start HAAT in the next week to two weeks. Sith not on a set schedule yet but are set to auto start anytime one isn't running and we have the tickets. Currently running Sith at T3 as our focus right now is working on doing HAAT. We are an EST guild. 2. required to contribute a weekly average of 300 daily tickets however we do understand that real life takes priority we just ask that you inform us if there is a good reason you can't meet that sometimes. We check weekly for a 300 daily average. 3. must sign up on swgoh.gg website and have profile setup to sync and public. 4. must communicate. we don't expect you to be a super chatter box but must keep up with info and follow instructions posted in discord. So discord is a requirement. We are pretty laid back in general but we are active and want members who are actively pursuing this game and trying to always improve. We are a learning and training guild so we love to help people to learn the ends and outs of this game and strive to make you the best you can be. 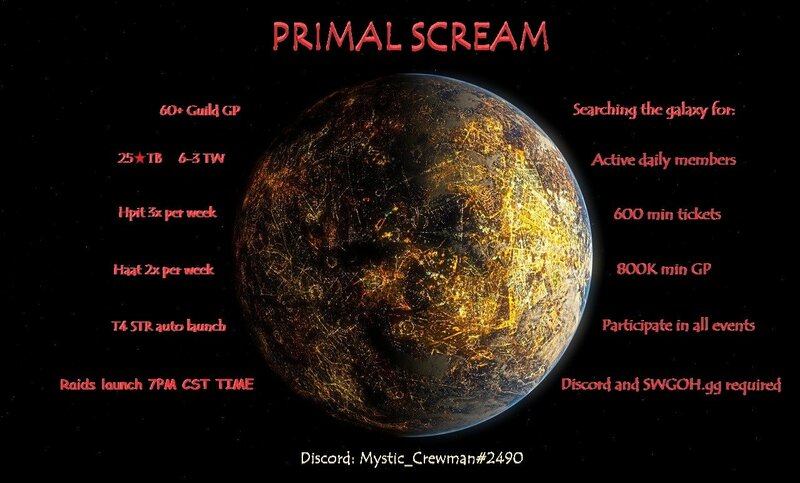 If interested or you have any questions please feel free to join our recruitment channel on discord where one of our officers will be happy to help you or message me directly. 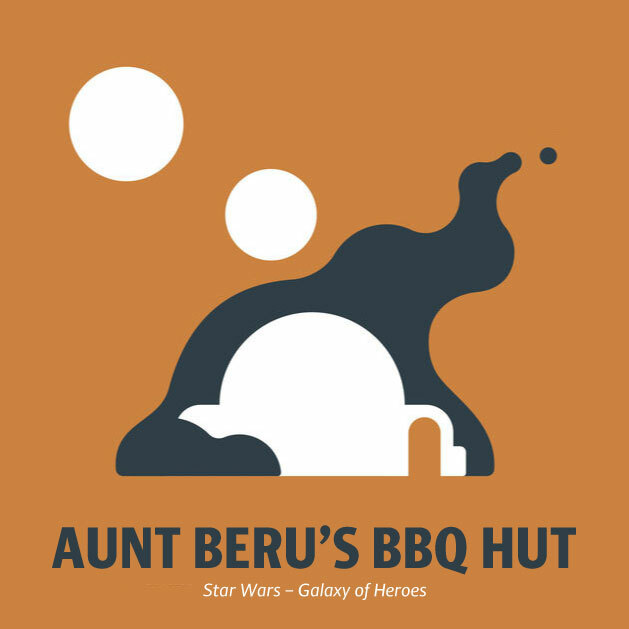 We are Aunt Beru's BBQ Hut!!! 123+ Million GP Guild looking for ONE member. That's at least 2 zetas each TW, win or lose, guaranteed! Putting together heroic STR, going for real soon, come join! We have one space available. We are looking for 2 million GP (or close to it) 600 daily energy. We rotate raids +6hrs after each, 24hr 0pt participation hit. We get 39-40 stars on both TBs. We are a laid back group, we truly are family because a lot of us have been gaming together for years. We have the experience in getting things done, we work well together and we just have FUN first! We use group me chat app, so come talk to us and see if we are the right fit for you. Four spots open in a rapidly growing guild (1M GP per week)! We have few minimums other than zero damage 24 hours for heroics, and we ask that folks at least have 50% participation (300+ ticket average, 50% + participation in TW and TB). We're growing nicely but having fun doing so. 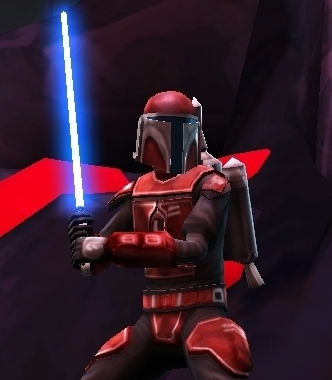 We think the ideal member would be a newer player (750K - 1M GP) looking to grow in a community or a more established player who doesn't yet want the stresses of Heroic Sith raids. If interested, please send me a message on here or on Discord @Baniss#1158. Thanks! We are looking for players that are wanting to build their bench but not necessarily ready for HSTR yet. We've been doing T5 STR consistently. With new members might move to T6. Also happy to see players on their way down from Heroic guilds who want something a bit more casual! GMT-8 is a friendly casual-heroic guild, but still competitive. We win more TW than we lose, we got 40* in latest DSTB and always get high 30s in TBs. HPIT takes 10 mins, HAAT about 2 hrs. Bloodied Kyber is looking for members! We are more than happy to help each other grow! T4 STR on auto launch. Are you sick of being a weakling? Does your current guild have lazy slackers who can't even do 400 energy? Are they holding you back from true greatness? Are you lonely too?! Then Join the Tosche Station Nerf Herders (139 million GP) today! Our guild houses the most eccentric and lovable goofballs you'll ever play with in any game ever! The blood, sweat, doughnuts, and tears! The camaraderie, the JOLLY COOPERATION!- is unlike any other guild you've ever been in! If it wasn't obvious already, we're a chatty bunch and no topic of discussion is taboo for us! Wanna talk about sports? Check. Tv and movies? Check. Why New York pizza is best pizza? Check. Best waifu? You know it! Check, check! 4. Must be a dandy guy...in space! Aurora Guard is Recruiting! Well established 70 million GP guild with a core of great players! Following a merge we have lost some of our best hitters, but this gives a great opportunity for mid-game players to jump in and grow with us..
1 million+ GP players wanted, preferably players with experience and a solid core of levelled characters, but all will be considered. We have 12 spaces available, so feel free to bring friends! We use discord for communication https://discord.gg/3UreWU3. Alternatively, add me for more info (dustipher#1317). PM me on here or join the discord if you are interested and we'll get you into our guild in no time. 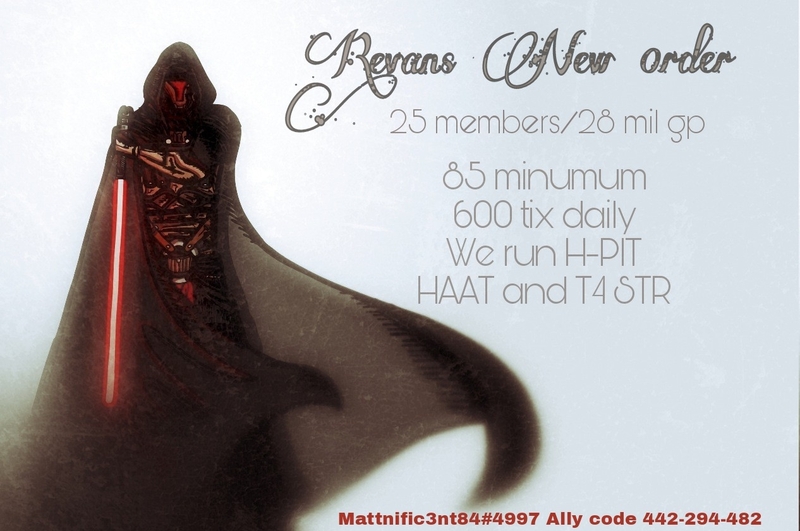 We are a solid tier 6 Sith Raid guild looking for 5 more very dedicated players who are between 1.8-2.5M GP to bring us back to a full 50/50. We’d accept lower GP members if they have JTR or a solid KRU/FO or Chex Mix squad. We are looking for active daily players who will contribute a minimum of 500 guild tickets/day and participate every day in Territory Battles (required) & Territory Wars (preferred but but not mandatory). Although we only require 500/day the majority of us hit 600/day and we average around 575/member/day. We use Discord to communicate on since the in game chat is not sufficient to be successful. Heroic rancor has a 24 hour zero damage phase followed by a FFA. We alternate raid times between 3:00 AM, 11:00 AM and 7:00 PM (Pacific U.S. time). We have members all over the world and this allows everyone to have a raid time that is convenient for them. Rancor is gone in 10 minutes (we wait 10 minutes to post damage to be sure that everyone was able to enter the raid). We also do 24 hour zero damage HAAT and alternate times between 4:00 am and 4:00 pm Pacific. We really don’t care if you don’t have a HAAT squad since we blow through it and are focussed on Sith Raid. We are doing tier 6 Sith Raids and knock them out without wasting any raid tickets. Sith Raid is currently the guild’s #1 priority so if the new raid doesn’t interest you then we will not be a good match for you. We’ll attempt heroic Sith Raid in 2-3 weeks to get a feel on how close we are. Our guild is at 90.7M GP. We get 34* in ls TB and 36* in ds TB when we were 4 members short. We have a clear plan every day so that everyone is on the same page, doesn’t have to spend time thinking about what they should do, and so that we can maximize our rewards. We will continue to work on and fine tune our Territory Battle plan as we continue to improve and grow as a guild. We are now somewhere in the area of 23-7 in Territory Wars. It's simple my fellow SWGOH Gamers. We are a small but up and coming guild. We are tough and have great players. We're looking 4 dedicated team players that agree that helping each other out & guild communication at all times is the key to success. Based on the above, promotion to officer @ Lvl 80 is possible. Don't be shy to ask questions or request help. Someone will be more than glad to assist. That's it. We have fun and enjoy comradery. Hope to see you on the other side and keep on gaming! Our guild, S1th Faced, has 1 opening. Mature, adult 60 Million gp guild. Must be level 85 and active. Discord NOT required. In-game Chat is now perfectly fine. We do Heroic Pit and Tank raids. Tier 4 Sith raid, working our way up. Only rules are to follow notes for each deployment area in TW and to be active. But we keep a chat open for people to let us know when they are away so they don't get kicked. About Us: Established Guild with a GP of 77M. Great group of guys and gals that are very active every day and will help you grow. Very minimal rules as we like to have fun; just looking to expand the guild to fill a few open slots. Raids: Heroic Pit 3x per week, Heroic Tank 2-3X per week, working on Sith Tier 5. Pit and HAAT stagger start times 1PM ET and 7PM ET. Daily Activity: Expect to be active every day, especially with Sith Raid and TW and produce at least 500 raid tickets daily. What we are looking for: Level 85 and 1M+ GP; legendary characters are preferred to help with Sith Raid. 4 open spots available. Message me here or in game to join. We are Revans New 0rder. We are 25 members strong currently looking to grow our ranks. We are currently running H pit, haat and T4 of STR, currently working on our Hstr teams. If your almost there, or want a little help, we offer squad building and mod placement help. We're just a group of guys that love the game and are very active, ZERO drama. Message me if you want more info. Only accepting members around 1 million GP right now. We get 27-31 stars each TB and get a zeta or 2 each TWars. Haat and Hpit, Tier 5 Sith Raid. We’ve got a total of 80 million GP right now and 45 members. Open to discussion on a merger of a small nature.